ProcessHQ, Inc. was established in 1999 as a Delaware corporation, to address the need for a vertically integrated bioprocess manufacturing solutions provider to serve the burgeoning West Coast biotech market. From its inception, the company has focused exclusively on its target market to provide clients with a comprehensive, focused solution that leverages the founders' thorough understanding of the biotechnology industry, its technology, and its specific needs. 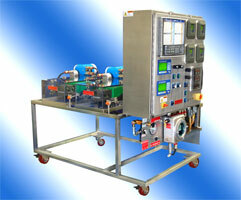 Our specialty is bringing innovative and cost efficient solutions to market to solve challenging process problems. Working closely with a strong lineup of industry partners, we strive to meet and exceed our clients' expectations for quality, service, and cost. The ProcessHQ.com online procurement site was developed to provide a solution to the high cost and inefficiency of the traditional sanitary process equipment purchasing process. ProcessHQ.com enables process manufacturing professionals to evaluate equipment, obtain component specifications, and place orders, all without leaving their desks. Our comprehensive online catalog allows end users and purchasing agents to select from a full line of specialized components, materials and equipment necessary for sanitary process manufacturing. In the spirit of collaboration and open exchange of ideas, the ProcessHQ.com web site hosts a Community Resource Section, for process manufacturing professionals. The community section includes resource guides and links to other web sites that may be of interest to our clients.